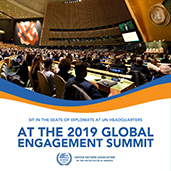 The UNA-USA Global Engagement Summit on February 22, 2019 invites UN advocates to participate in a day of dynamic and informative discussions on the most pressing issues facing the United Nations. Top grassroots change-makers from across the U.S. will sit in the seats of diplomats at UN Headquarters in New York City to engage with international experts and world leaders on the most pressing global issues of our time. Join USA-UNA for this unique day of collaboration and inspiration, and experience the rare opportunity to participate in global problem solving in the UN General Assembly Hall at the UN. "Grenada is a warm and welcoming host to thousands of Americans each year, and many U.S."
The Caribbean American Heritage Foundation of Texas congratulates Grenada on its 45th Anniversary of Independence, February 7, 2019. The Houston Grenada Association will celebrate independence day on Saturday, February 9, 2019 at the Ensemble Theater at its Annual Scholarship Gala, located at 3535 Main Street Houston, Texas 77002. "On behalf of the Government of the United States, congratulations to the people of Grenada on your 45th anniversary of independence on February 7. Grenada is a warm and welcoming host to thousands of Americans each year, and many U.S. students also call the Spice Isle “home.” The United States values our strong people-to-people ties, which have laid the foundation for our ongoing partnership with Grenada to combat drug and human trafficking, mitigate the effects of natural disaster, and promote economic prosperity and entrepreneurship. We look forward to deepening cooperation in these areas as we work together to implement the U.S.-Caribbean 2020 initiative. The United States values this longstanding friendship and wishes the citizens of Grenada a happy Independence Day celebration."